A special Dean Ambrose segment needs a special review in here. So be prepared for the words only – nothing but the words – just the words. Make yourself comfortable, get some cookies and enjoy. I don’t really want to jinx it for him but it kind of looks like that Dean Ambrose is on his way back to normal – his normal, i.e. the Jon Moxley normal. So, like he was portrayed on RAW and now on SmackDown was simply hilarious and proofed that you don’t have to make him act childish to entertain everyone in the audience, also the 5-year-olds. Because 5-year-olds aren’t that dumb like Vince McMahon perhaps thinks they are. They already have a brain. It doesn’t come in via OP when you are 18 resp. 21 years old. But I don’t want to spoil this fabulous segment on SmackDown with my usual rant. Because there simply wasn’t anything I should rant about. It was pure gold, so I decided to put it all in here – word by word. First and foremost, thanks to Gia who basically transcribed the whole piece. I only did the fine-tuning this time. Without her help I probably would have only finished this piece on Monday after FastLane. So, thanks again; and now enjoy: Dean Ambrose on commentary – just the words. We’re having some fun tonight. Dean Ambrose joining us here on commentary as R-Truth is set to take on the Intercontinental Champion, Bad News Barrett, the man Dean Ambrose will meet for the championship this Sunday at WWE FastLane. Yeah, the Intercontinental Champion, Wade Barrett. I don’t know if you guys know this about me or not, but I’m a bit of a history buff, all right? I appreciate the great heritage of our great business. The Intercontinental Championship is one of the most prestigious, most celebrated championships in the history, worn by guys who took pride in going out there every night, being the workhorses of this company. Fort Lauderdale, make some noise! What’s up? What’s up is Wade Barrett is now the Intercontinental champion? … what on Earth is Truth doing? That’s from, like, Ninety-three; although it is a great song, it’s on my iPod… And there he is, your Intercontinental champion Wade Barrett. So, Byron, go ahead, ask… Byron, ask Dean the question you have. Dean, with all due respect, you talk about the pride and the honour of the Intercontinental Championship – is there still pride in zip-tying a man’s hands to force him to sign a contract? Hey, you know what? You’re gonna wear that Intercontinental Championship, you’re gonna have to defend it, all right? You’re gonna have to live up – live up to the reputation of a Pat Patterson, you’re gonna have to live up to the reputation of Stone Cold Steve Austin – guys who made that title important. You’re not gonna run and hide. I’m not gonna let it happen, all right? If I’m being a defender of the history of the business – and that’s what I’m being, all right? Dean, actually, Byron sort of candy-coated the question. Basically, he wanted to know why you would believe that that signature is binding – that it would be a binding contract having any kind of value. Well, I went to WWE dot com, and there was a graphic that said Bad News Barrett versus Dean Ambrose at FastLane on the WWE Network for the Intercontinental Championship, all right, and everything you read on the Internet is true. Here’s a cover by Barrett as he looks back at Ambrose – and a kick out. This is you Sunday, tough guy. That’s a nice chin-lock, buddy. But I’m all the way over here. I got a hundred ways to get out of a chin-lock like that, Wade Barrett. You don’t know anything about it. You’re not a fighter. You’re a talker. You’re a hider. 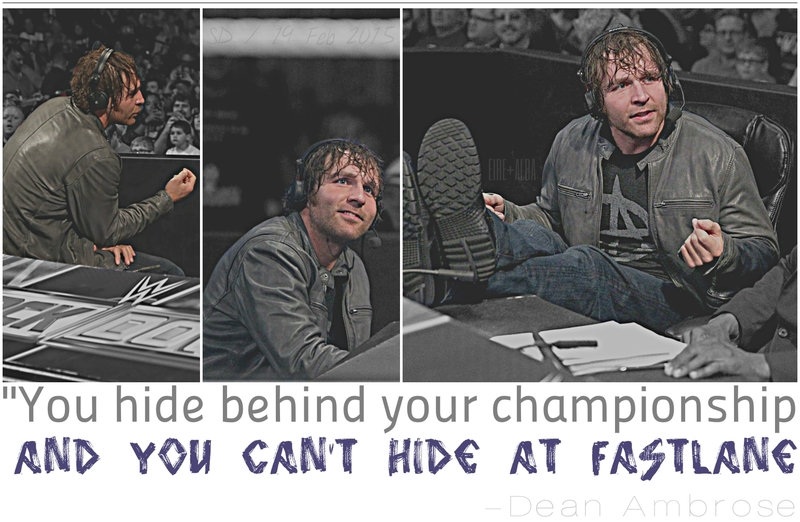 You hide behind your championship, and you can’t hide at FastLane. So why do you think Barrett dodged you for so many weeks, Dean? Cover! By Truth – and the champion kicks out. … one would think a champion would want to rectify that mistake, would want to get that win back, but apparently Wade Barrett is not acting like a champion these days. You bloody see that, huh? Coming for you Sunday, son. You want a piece of me? Ugh. Yeah, you know what? You do pull off that shirt. I ain’t very impressed with the way – that, you know, because as, you know, as a guy like Saxton might say that you’re old and shouldn’t dress like that, right? You watching this? Huh? (punches Truth) FastLane! Dean, you’re actually laughing about all that, by the way. So obviously you’re not impressed. I don’t think Dean even wants to watch this. Uh, no, I’m not impressed with Saxton’s suit at all. What’re you looking at me for? Look at your opponent at FastLane! I own two suits. I only own two, and I bought them both from Wal-Mart. They both look better than yours. Oh, look at Truth – Truth lookin’ to steal one here! Shoulders down. He got it! Truth got it! Truth beat Barrett! Truth beat Barrett! That’s your fault, by the way. You made him mad. He was rude from the start. Guys, that was the greatest thing I’ve ever seen. Dean Ambrose turns his back on Wade Barrett, and Wade Barrett is so incensed that he’s screaming at Dean Ambrose – not looking at R-Truth, and he gets rolled up and beaten. And that’s because this coming Sunday at WWE FastLane, on the WWE Network live, Bad News Barrett now has to defend his Intercontinental Championship against Dean Ambrose. And, King, Barrett’s going in on a losing note. That losing streak may continue right down in Memphis at FastLane. So did you get the answer you wanted? No, I didn’t get the answer I wanted, but I tell you what – Ambrose better pay respect to that man, the Intercontinental Champion, or he may regret it at FastLane. I shouldn’t forget to dish out a special praise towards Wade Barrett who simply acted as the annoyed but somehow still attention seeking counterpart of Dean Ambrose at his best. These both guys together in a feud is pure joy to watch. Both of them are two personal favourites of mine, so naturally I wanted them together in a feud at some point. You never really know if it works before you actually do it. But I had a feeling that this could be good. Well, actually I wasn’t entirely right because in fact, this is not just good, it’s great. And I simply hope for a good match, that WWE gives them enough time to built a story, even if it will be a mid-card match. The only thing I’m actually slightly disappointed about (so far) is that Dean Ambrose didn’t mention William Regal as a former Intercontinental champion. But it’s not too late for that. If Dean Ambrose wins the belt on Sunday, then put him again on commentary during a match of Wade Barrett, so he can be the one who decides if he’s worth a re-match – preferable put him on commentary on a SmackDown episode, so Dean Ambrose can mock the suit of Byron Saxton and the shirt of Jerry Lawler again.